Are you facing challenges to keep track of all the insurance claims and deal with the denials as and when they turn up? Claim denials have become so customary in today's healthcare sector that it has become an industry-wide problem. Increasing administrative costs, bad debts, underpayments, etc. are a few precursors to a mismanaged medical insurance claims processing. At Outsource2india, we combine the best of technology and expertise to ensure that your claims get processed within the stipulated time and you receive full reimbursement. Our reimbursement managers and insurance support executives are expert in processing clean & accurate claims. They can either log into your claims processing software or use the software of your choice. They verify the mandatory fields like Received Date, ICD-10, Date of Service, and line items. We can reorganize the claim processing by streamlining the data processing part of the insurance claim form. We can verify the insurance document, verify the patient coverage, and correct any misinformation. We can convert the huge volume of claim records into digital images, irrespective of the formats. We can disburse the claim within the timeline through duly follow-ups, corrections, or whatsoever necessary steps are required. Under our claim adjudication services, we engage a team of experienced claims adjudicators and IT professionals to deliver effective claims adjudication solutions to the payers. Our claim support & auditing services are a blend of data processing tools and qualified auditors who can audit the claim, perform underpayment analysis, find solutions for recovery, and post payments for the clean claims. Our medical claims account settlement service covers the necessary follow-ups with the insurers and payment agencies until the final settlement is made. Why Choose Outsource2india for Medical Insurance Claims Processing? O2I is an ISO 9001:2000 certified organization and firmly sticks to HIPAA and HL7 compliance standards. At O2I, we have mandated the policy of HIPAA at every stratum of the organization. The medical records are stored in a folder whose access is only on the need basis. No two professionals have access to same folders. We are an ISO 27001: 2013 ISMS certified company. It strengthens our determination to establish, implement, and advance the information security management system within the framework of your healthcare facility. It also binds us to secure your legal, personal, financial, technical, or business-related information. We have a combined experience of 20+ years in the healthcare insurance support domain. Our medical support professionals surpass 200 in capacity, and our total management experience exceeds 100+ man-years. 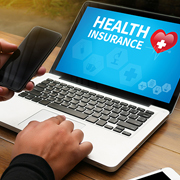 Thus, when you decide to outsource medical insurance claims processing services to us, you can be sure of receiving a highly professional insurance claims support service. Our workplace, delivery centers, and offices have modern equipment and infrastructure necessary to make us a leading medical insurance claims processing company that we have become. We have advanced built-in IT redundancies, firewall, and intrusion detection technology, VPN technology, 200% power backup, autonomous Internet Leased Circuits, etc. It allows us to deliver quality offshore medical insurance claims processing services on time. We leverage our global reach to provide world-class medical insurance claims processing services by making use of the local capabilities. For that to happen, we have established five different delivery centers and have four offices spread across the globe. We provide round the clock support with a dedicated team available 24*7. You can be certain that our healthcare support agent will be always accessible for calls or chats during your work hours, irrespective of the work time difference. At O2I, we have the bandwidth to go through the granular level of healthcare insurance claim processing. We have enough resources, both in terms of expertise and tools to spike the deliverables. We believe in providing individual attention to all our customers. That is why we arrange a dedicated medical insurance claims processing executive that will be also your one-point contact and can render undivided attention to your project. We duly follow-up on each claim and provide accurate medical insurance claims processing services within the deadline. We plan all our insurance support services in advance that eliminates any risk of delay. Moreover, we have a substantial pool of resources who can handle any deadline pressure, if that occurs. Overall I am pleased with the support. The response time and communication are fine. Knowledge about billing and claims is excellent. Outsource2india has been a leading provider of medical insurance claims processing services and a plethora of other medical billing and coding support services around the globe. Our team comprises some of the most talented reimbursement experts and healthcare insurance support executives who can carry out medical insurance claims processing services to improve your facility's cash flow and streamline the administrative operations. You can also depend on us to improve your organization's efficiency, enhance your employees' utilization, and increase the reimbursement rate. If you are looking for a dependable, accurate, and cost-effective medical insurance claims processing services in India, then, look no further. Get in touch with us today!